Our philosophy is personal development for the INDIVIDUAL. Not basic, canned workouts or the fad of the month. Our focus is building strong, capable bodies, at any age or experience level. We believe nutritional health as well as mental health are an integral part of stay fit, healthy, and vibrant. At Physique Etc. Personal Training Studio, we believe it is possible for anyone to achieve personal health and fitness excellence through focused, intelligent training. Geof Suits As the owner with his wife Amy, Geof brings to Physique Etc. Personal Training Studio 15 years of experience as an NFPT Certified Personal Trainer. During this time, Geof has worked closely with physicians, physical therapists, and others in the medical field to acquire extensive knowledge of the human body and movement. Geof specializes in post rehabilitation, having taken the ISSA Post Rehabilitation Specialist course. His knowledge of biomechanics and human function allow him to quickly assess the functional needs of his clientele, and develop a plan to best suit the individual. Amy Suits Amy’s love for fitness and athletics began in high school as a varsity volleyball player at Woodland Park High School. Her passion for helping people led her to UC Colorado Springs where she acquired her Bachelor of Arts Degree in Psychology. Geof OUTDOORS... In a word, this is who Geof is. If there is an outdoor adventure, he is most likely participating. Geof has a passion for adventure sports: climbing, hiking, cycling (both road and mountain), skiing, ski mountaineering, and just about anything else he can think of. His experience early in his career as a competitive bodybuilder taught him the drive necessary to excel in these sports and he carries this passion and drive to his clients. Geof also has a competitive side. 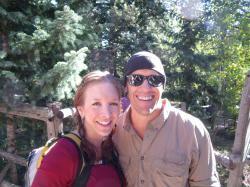 He was 2nd in Colorado in the Mountain States Cup Downhill Bike Race Series in 2004. Geof competed at the state level in bodybuilding and won 1st place in his class at the Colorado State Natural Bodybuilding Championships in 1992. Geof has also participated in both cross-country mountain bike racing and track cycling racing. Recently, Geof started another phase of his career as a Certified PSIA Ski Instructor. For the past three seasons he has been employed part-time at Loveland Ski Area. Geof is continuing to advance in the field, bringing his years of one-on-one experience to the Colorado slopes. Geofs' family is what is most important to him. It is a blessing to him to be able to share his passion of life and fitness with his wife Amy, and share the experiences of life with his daughter, Alex. Amy After becoming a mother, Amy began to focus on mental and physical health, not only for her, but for others as well. She acquired her NFPT Personal Training Certification in 1996. In 1998 Amy put her efforts to the test and entered her first bodybuilding competition where she placed first in her class. Amy’s primary focus is on women’s outer, as well as inner, health. Amy is also a Certified Christian Life Coach, and brings this unique perspective to her clientele. She believes approaching the body, mind, and spirit holistically, achieves complete, systemic results. Amy’s hobbies include: hiking, biking, training on ‘The Incline’, scrapbook creation and raising a teenage daughter and her other child, her husband.